Spacecraft Crashes Into Moon In Search Of Water NASA successfully smacks a satellite and spacecraft into a crater near the moon's south pole, which was expected to toss up huge plumes of debris visible from Earth. Infrared cameras on the instrument-laden space probe were to search the debris for water ice and vapor. NASA officials say two probes hit as planned, but live images disappeared seconds before impact. 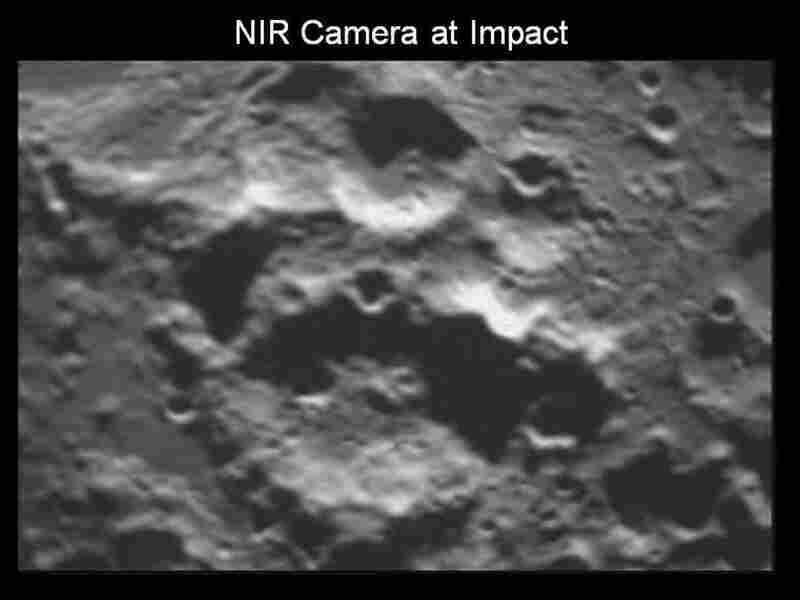 LCROSS impact crater as seen with the visible light camera. 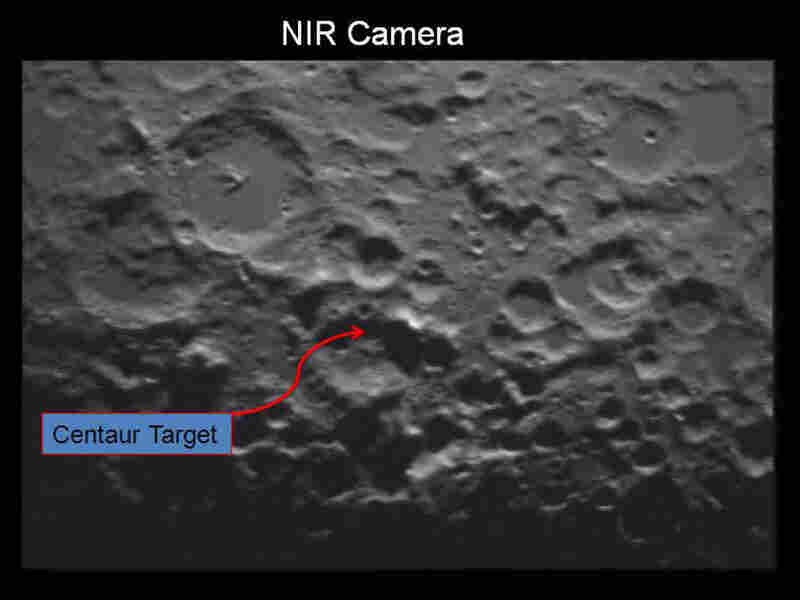 LCROSS impact crater as seen with the near infrared camera. 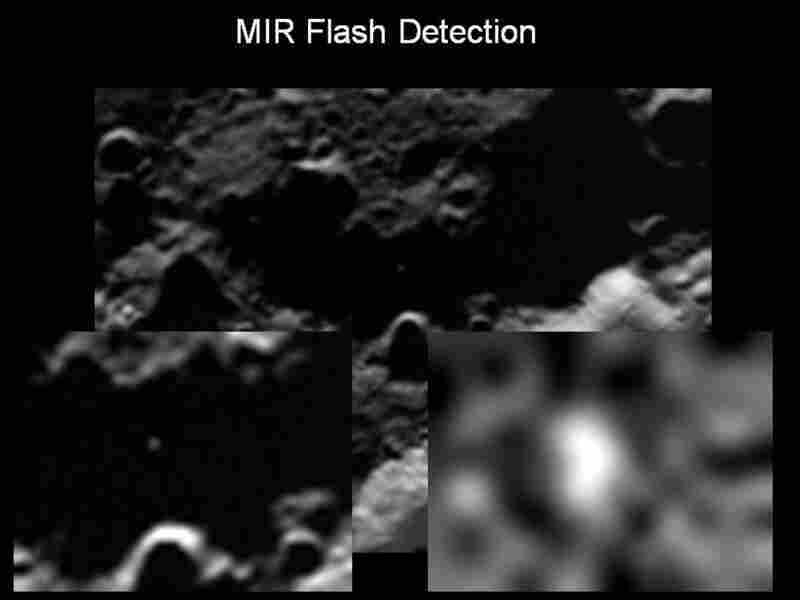 LCROSS impact crater as seen with the mid infrared camera. Sodium flash detected with the mid infrared camera. VIDEO: NASA's animation of the LCROSS lunar impact. NASA crashed a piece of space junk into the moon's south pole this morning to find out if the dark, cold craters there contain water in the form of ice. The impact of the 2.2-ton empty rocket part kicked up a cloud of dust. Then, a spacecraft flew down through that dust, checking for water, and sent data and live footage of the impact back to Earth, before crashing into the moon as well. NASA broadcast the images on its Web site, but it wasn't as dramatic as some had hoped — just a scene full of gray craters that slowly got bigger and bigger as the spacecraft seemed to creep toward the moon frame by frame. Viewers did not see a flash from the impact itself or the cloud of dust that followed, although NASA did say the spacecraft's instruments appeared to be working normally. Researchers are now analyzing the data gathered from the event, NASA said, and expect to know for certain if the impact dislodged any water in about two weeks. 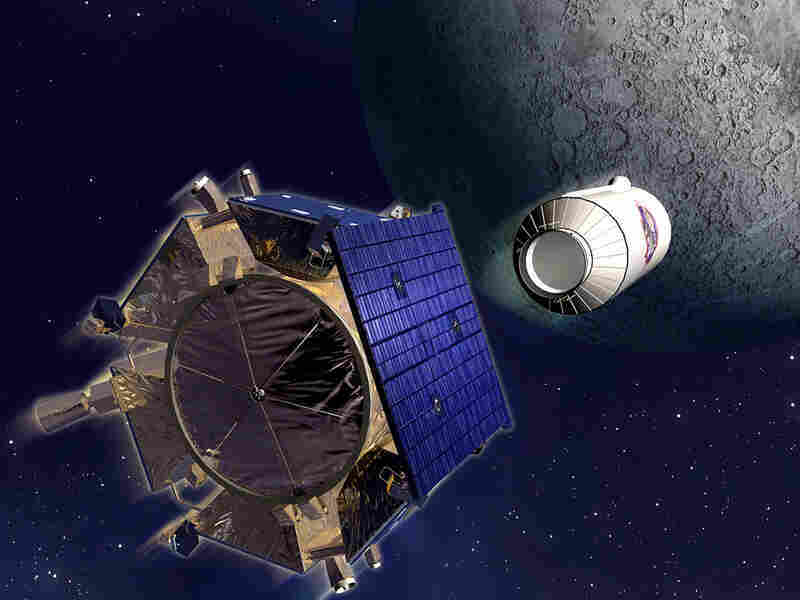 The Lunar Crater Observation and Sensing Satellite, or LCROSS, mission blasted off in June. 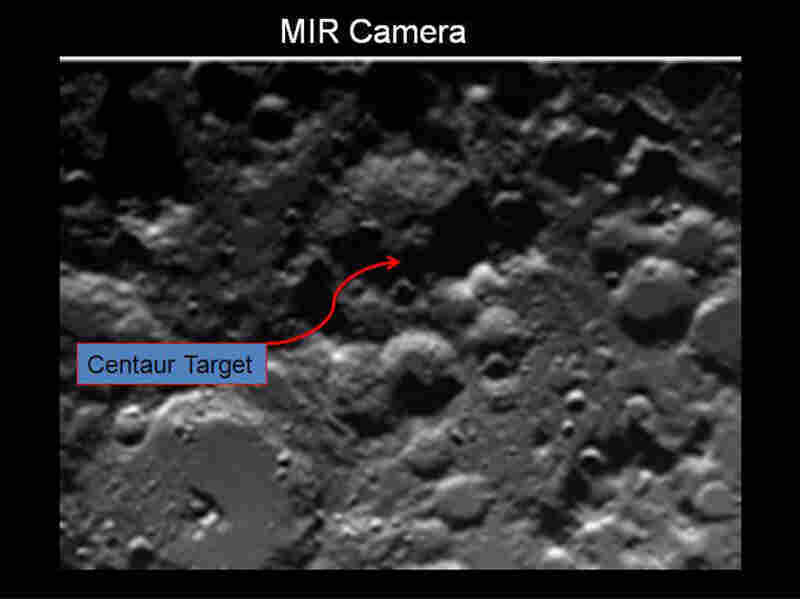 Its target was a dark, cold, permanently shadowed crater near the moon's south pole. Scientists suspect that craters like this one might contain water in the form of ice. At 7:31 a.m. EDT, the LCROSS mission sent an empty rocket part that weighs as much as a large SUV crashing into the target crater at around 5,600 mph. 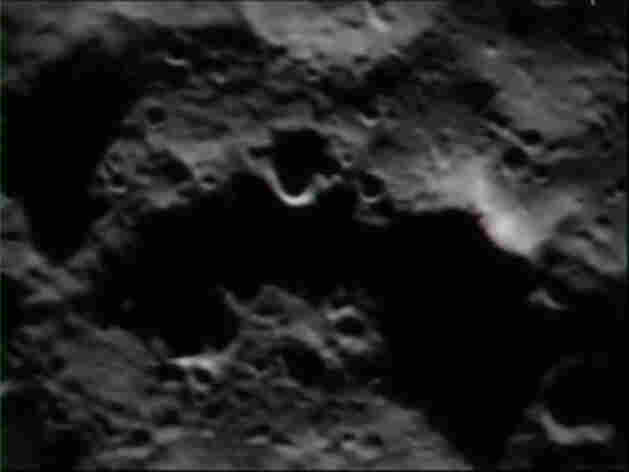 "It will kick up whatever is on the floor of the crater. That may very well include water ice. That is the whole point of the mission," Dan Andrews, NASA's project manager for LCROSS, said before the impact. Four minutes later, an observation spacecraft equipped with five cameras and four other scientific instruments hit the lunar surface. It was to fly right through the plume created by the first impact, and the instruments were to study the cloud's composition and send data back to Earth in real time. All the information had to come back immediately because the probe had only minutes to gather data before crashing into the moon. "And game over, we're done," Andrews said. Back on Earth, professional observatories and amateur astronomy groups were watching for the plume through telescopes. The Hubble Space Telescope was keeping an eye on the impact. At Los Angeles' Griffith Observatory, people who got up before dawn to look for the crash threw confused looks at each other instead, with one telescope demonstrator calling the celestial show "anticlimactic." "I was hoping we'd see a flash or a flare," said Jim McMahon. The moon was expected to be left with a new crater about 60 feet wide and as deep as a swimming pool. NASA has emphasized that the impact won't hurt the moon, which is used to getting hit by space objects. It has no atmosphere to protect it and constantly gets bombarded by all kinds of meteorites, large and small. Scientists hoped to know quickly if they've found evidence of stores of water stashed away in the moon's dark craters, and they began analyzing images and data immediately after the impact. Anthony Colaprete, the NASA project scientist for this mission, said his team already knows enough to say that LCROSS was successful. "I can certainly report there was an impact. We saw the impact. We saw the crater," he said. "And we got good measurements, spectroscopic measurements — which is what we needed — of the impact event." 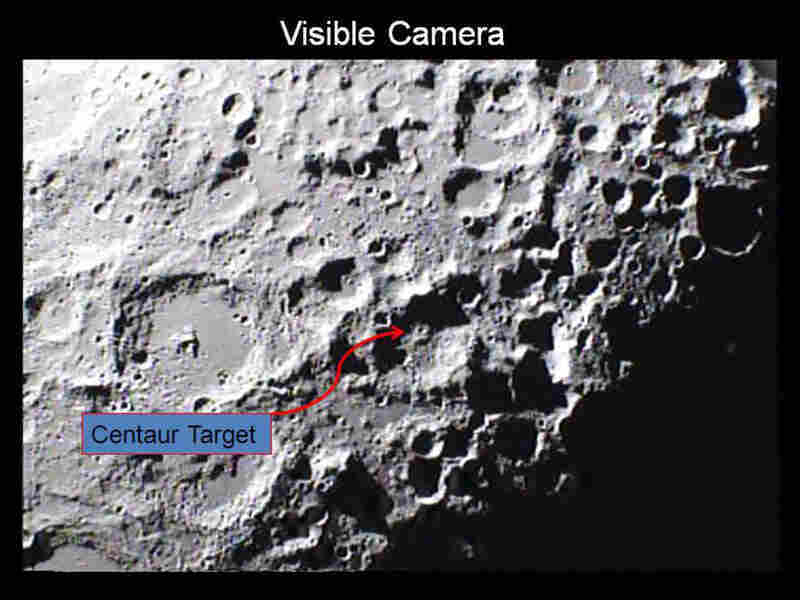 Colaprete said it looks like they'll have the data they need to answer the question: Is water hidden inside the moon's darkest, coldest craters? He said it will be a while before they make any announcements. "We've just got to sit back and be careful," he said. "Life is full of surprises. We want to be careful, not make a false negative or a false positive claim." This is of interest to NASA in part because future moon explorers might be able to make use of this resource. Last month, scientists announced that they'd found evidence of small amounts of water spread over the surface of the moon. Although the finding was a surprise, researchers stressed that the soil on the lunar surface is drier than any desert on Earth. The Obama administration has been reviewing NASA's current plan to build new rockets and capsules that could return humans to the moon by 2020. A panel of independent experts has reported that this goal is not feasible unless NASA's budget gets a major boost.